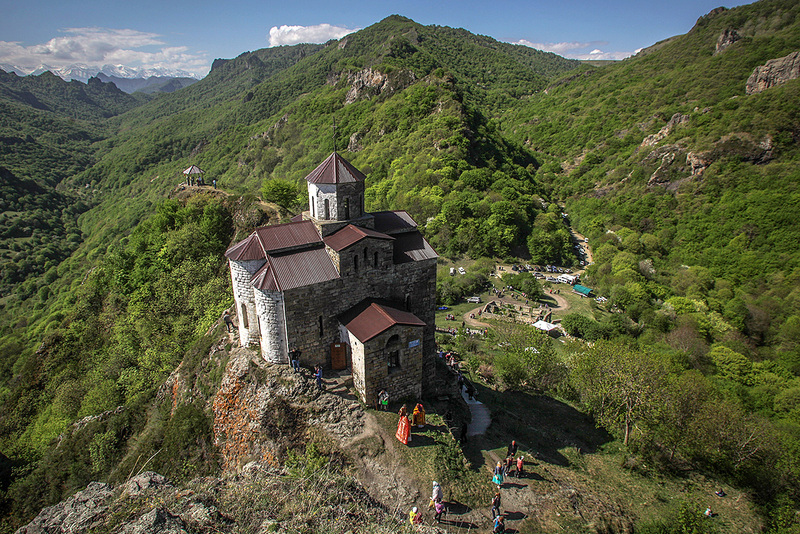 A Shoana Church (the 10th century) outside the village named after Costa Khetagurov in the Karachay-Cherkess Republic. Russia is generously bestrewed with buildings and structures that date back centuries. They witnessed history in the making: The Tatar-Mongol yoke, the invasion of the Teutonic Knights, and even Christ's first disciple - apparently. Structures made of huge stone slabs with mysterious openings at the side can be found in Kuban, the Caucasus, Siberia, and near Solovki, the former prison camp 1,500 km north of Moscow. They are called Dolmen and they’re similar to the famous Stonehenge in the UK. There are many theories about why they exist and what the strange holes were for. The only thing scientists agree on is their age: They were erected throughout Russia in the third and second centuries BC. In the North Caucasus alone (the Gelendjik, Novorossiysk district, 1,500 km from Moscow) there are about 2,300 of the bizarre stones. One train of thought is that the structures served ancient cults or were used as crypts. As many of the Dolmens were excavated, human remains with various belongings from different eras were found (people believed the items would be of use in the afterlife). In one Dolmen, discovered in the Krasnodarsk Territory (1,273 km from Moscow) 72 human remains and a stone disk with astral symbols were found. Today this five-ton sarcophagus is exhibited at the Historical Museum in Moscow. According to local legend, dwarfs lived in the Dolmens. Supposedly they were so small that they rode rabbits like we ride horses! Today, visitors explore the stones and try to climb through the circular openings. This Lutheran church was built in the 13th century in a deserted area as a sanctuary for the Teutonic Knights, and today it’s the oldest building in the Kaliningrad Region. It was built to defend against any sieges, which is why it resembles more of a fortress or a small castle. Its impenetrable walls preserved it from the ravages of time and conflict. It witnessed the Kingdom of Prussia come and go, survived WWII, but failed to withstand the Soviet Union. In the 20th century the Teutonic Order Kirche suffered the same fate as many other religious buildings enveloped by the USSR: It was dissembled brick by brick. In 1985 the building came into the possession of the Russian Orthodox Church. It was fully restored and is now used as a church. The Church of John the Baptist in the center of Kerch, in Lenin Square, was built before the Great Schism that divided Christianity into Orthodoxy and Catholicism. If the Greek sign visible on one of the church's columns is to be believed, the building dates back to 757 BC. There are two legends concerning the appearance of the shrine. One, the more romantic, says the church was found in the sea. This legend is supported by the fact that earlier the shrine stood by the sea and there were many prints of seashells on its walls and vaults. Another legend says the shrine was built on the place of another ancient church, which was blessed by one of the twelve apostles of Christ, Andrew the First-Called, who preached near the Black Sea. The church's courtyard has a stone panel with a footprint that belonged, as believers are convinced, either to Andrew the First-Called or to John the Baptist. Shoana Church in the Karachay-Cherkess Republic is rather modesty compared to other ancient buildings in Russia. It is only 13 meters long and inside there are no paintings or opulent decorations. Under the layer of old plaster (as was discovered when a part of it split off) is a stratum of Greek, Arab, Georgian, Armenian, and Russian writing from various centuries, as well as North Caucasian astrological signs (the shrine was erected in the 10th century in the land of ancient Alania, which today is the territory of the North Caucasus). Until the 18th century the church had an old library, which mysteriously vanished. Subsequently, the shrine became a men's monastery. The area around Shoana Church has many burial grounds, which is probably why the shrine was placed there. What masterpieces were built by famous foreign architects in Russia?